Bandages Are Used For Wound Care In Medical Offices, School Infirmaries, Workshops And Other Settings Requiring First Aid Applications. Bandages are made of plastic, open weave fabric or 100% cotton for effective wound protection and long lasting durability. Aggressive adhesives stick securely in grease, oil or water. Heavy woven strips provide easy movement and allow skin to breathe for fast healing. 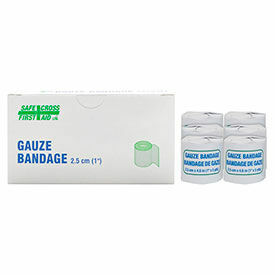 Gauze bandages are used for primary and secondary wound dressings, including burn care applications by providing fast wicking, absorbency and aeration. Available styles include Adhesive Bandages, Advanced Hemostatic Matrix, Advanced Trauma Care Hemostatic Matrix, Band Aid Variety Pack, Blue Oxywrap Soft/Dispenser, Butterfly Closures, Compress Bandage, Easy Access Bandage, Easy Access Bandages Dispenser, Elbow/Knee Adhesive Bandages, Fingertip Bandages, FlexFabric Bandages, Flex Seal Spray, Glacier Gel Blister and Burn Dressing, Hemostatic Matrix for dialysis/minor IV puncture/external wounds, Kids Adhesive Bandages, Patch Bandage, Strip Bandage and more. Package quantities vary from 1-1200. Widths and lengths vary per style. Blood Clotting Agents Are Used As First Aid Measures When Bandaging And Dressing Wounds. 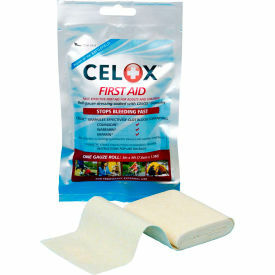 Celox® products provide a variety of sterile blood clotting agents used to treat minor to severe injuries and wounds. Both Granules and Gauze Rolls can be applied to the area of injury with pressure to help control and stop bleeding. Blood Clotting Agents are available in Applicator w/ Granules, Gauze Pad, Gauze Roll, Granules and Nosebleed Dressing. Piece counts are 1, 5 and 10. Sizes vary. First Aid Bandages Are Used For Applications Including Medical, Athletic, Emergency Services And More. 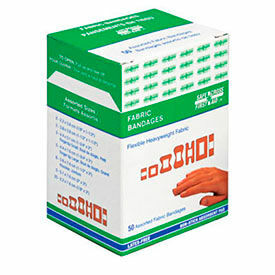 First aid bandages are made of cotton and rayon for long lasting durability and dependability. Bandages provide infection protection for cuts, scrapes, abrasions, burns and more. Open weave construction permits air circulation for reduced recovery time. Island pad seals out sweat, dirt and debris for contamination and infection prevention. Non-adherent design will not stick to skin, hair or clothing for convenient removal. Adhesive provides unit stability. Models are Compression Bandage, Fabric Bandage and Plastic Bandage. Styles are Assorted Sizes, Fingertip Small, Fingertip Large, Knuckle, Large Patch, One Size and Small Patch. Package quantities are 1, 50 and 100. Dimensions vary per model. 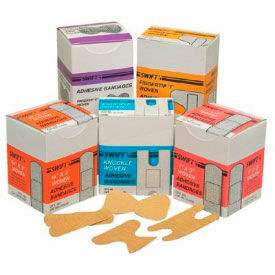 First Aid Gauze Pads And Dressings Are Used For Applications Including Medical, Athletic, Emergency Services And More. First aid gauze pads and dressings are made of cotton for long lasting durability and dependability. Units are used as a primary dressing over surgical incisions, lacerations, abrasions and more. Non-adherent dressings will not disturb or stick to wound. Encourages air circulation and light fluid collection for reduced recovery time. Styles include Gauze Bandage Roll, Gauze Pads and Telfa Sterile Non-Adherent Pads. Package quantities are 2, 4, 6, 12, 25 and 100. Color is White. Dimensions vary per model. First Aid Medical Tape Is Used For Applications Including Medical, Athletic, Industrial And More. First aid medical tape is made of high quality materials for long lasting durability and dependability. Tape protects hands from cuts, burns, sprains, contaminants and more. Improves user grip and is resistant to perspiration, washing, soaking and more. Non-adherent design will not stick to skin, hair or clothing for convenient removal. Porous design permits air circulation for reduced recovery time. Accommodates various temperatures and humidity conditions. Provides user comfort and wear resistance. 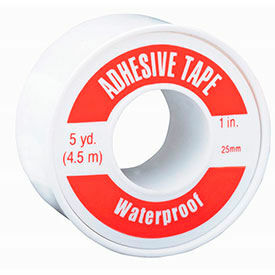 Available styles include Cohesive Gauze Tape and Waterproof Adhesive Tape. Package quantities are 1 and 12. Colors are Green and White. Dimensions vary per model. Bandage Scissors Are Used For Applications Including Medical, Athletic, Emergency Services And More. Bandage scissors are made of stainless steel for long lasting durability and corrosion resistance. 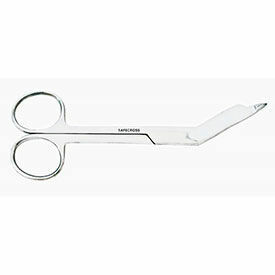 Scissors are used for cutting dressings, gauzes, tapes, bandages and more. Angled cutting blade and rounded blunt tip allow safe dressing removal without risk to wound. Style is Bandage Scissor. Package quantity is 1. Color is Stainless Steel. Dimension is 5.51"L.
First Aid Triangular Bandage Is Used For Applications Including Medical, Laboratory, Athletic And More. 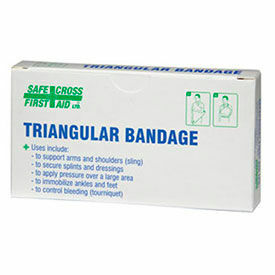 First aid triangular bandage is made of cotton for long lasting durability and dependability. Bandages are used for shoulder and ankle support, splints, bleeding control and more. Vacuum sealed for increased storage space. Includes two safety pins. Style is Triangular Bandage w/ Safety Pins. Package quantity is 1. Color is White. Dimensions are 40"L x 40"W x 56"H.
First Aid Compression Bandage Is Used For Applications Including Medical, Laboratory, Athletic And More. 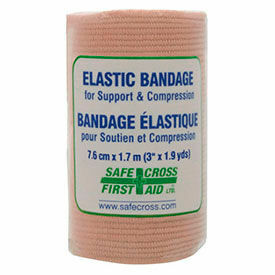 First aid compression bandage is made of polyester, acrylic and rubber for long lasting dependability. Bandages provide compression and support, reducing sprain and strain recovery time for elbows, knees, ankles and more. Units are reusable, lightweight and non-fraying for durability. May be used for post-cast support, dressing retention, swelling and more. Includes metal affixing clips. Type is Compression Bandage. Style is One Size. Package quantity is 1. Dimensions are 14.76"L x 2.99"W.